Plex is the best way to enjoy all of your media inside and outside of your home because it is so versatile and most companies incorporate the Plex client software into their media devices. The biggest problem using the Plex Media Server software is that you have to keep your PC running while it serves up all of your ripped and downloaded media. Netgear’s latest 802,11 AD router, Nighthawk X10, Did just that. Since most of us keep our routers powered up all the time anyway, what better place to run the Plex service. 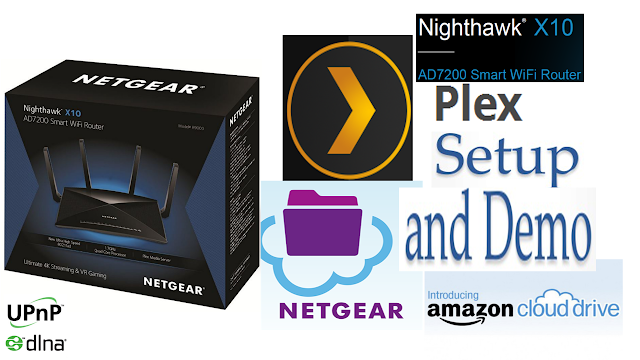 the Router will download and automatically update Plex server. Once installed you just have to point Plex to the folders you filled with media, usually on the same drive and Plex will index, Transcode and remux and serve it up inside and outside your home over the Wifi and without wires.